Jay Leno recently spent a day at AMG. He test drove the SLS AMG Roadster and SLS AMG E-CELL and also helped build an engine showcasing the 'one man, one engine' philosophy of AMG. Car aficionado and TV funnyman Jay Leno recently spent a day visiting AMG. After meeting with Mercedes-AMG Chairman Ola Kallenius, he was given test drives of the new SLS AMG Roadster and the SLS AMG E-CELL. His day continued with an up close look at how AMG hand-assembles their engines and even tried his hand at building a V8. His day started with meeting the AMG Chairman at the Stuttgart airport and then had the opportunity to begin immediately by taking out the SLS AMG Roadster. 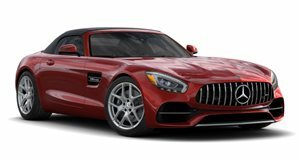 After hitting the highway and going through some country roads, Leno gushed: "The SLS AMG Roadster delivers top performance. Whether the engine, transmission, handling or brakes - you feel that the engineers at AMG are serious! When I was 18 or 19 years old I worked for Mercedes-Benz in America. I knew about the test track in Stuttgart-Unterturkheim from films in which Mercedes sedans like the 220 SE or the 300 SEL 6.3 were driven through the banked curve. I have always wanted to see this for real." He then continued his test driving with the SLS AMG E-CELL, noting its relative quiet and smooth power. The gullwing all-wheel-drive vehicle packs a powerful 526hp and 649 lb-ft of torque. Leno remarked how great the deceptively powerful electric car took to the road, comparing it to the primitive technology of his own Baker Electric from 1909 remarking "It&apos;s unbelievable how electric drive technology has developed over 100 years or so!" Leno&apos;s final activity of the day was building an AMG 6.3 V8 engine. With the help of two technicians, he installed the crankshaft, cylinder heads and wiring. After carrying out the quality tests he attached his name to the engine plate, sticking with AMG&apos;s philosophy of "one man, one engine." The host of the longest-running show on U.S. television showed his ability on the race track and in the engine shop. Leno burst afterwards: "AMG delivers unbelievable performance - whether by man or machine!"